This Popcorn Prawn Rolls recipe draws its inspiration from Americans love of grits, especially down south. The key is to use polenta as a crumb coating with prawns. On the side, we recommend a zingy jalapeno mayo for a killer dipping sauce! Coat the prawns in the flour, then combined eggs and Knorr Ikan Bilis Seasoning Powder; then mixed bread crumbs and polenta; fold well. Deep fry until cooked and golden. Combine the Hellmann’s Real Mayonnaise, jalapenos and coriander. 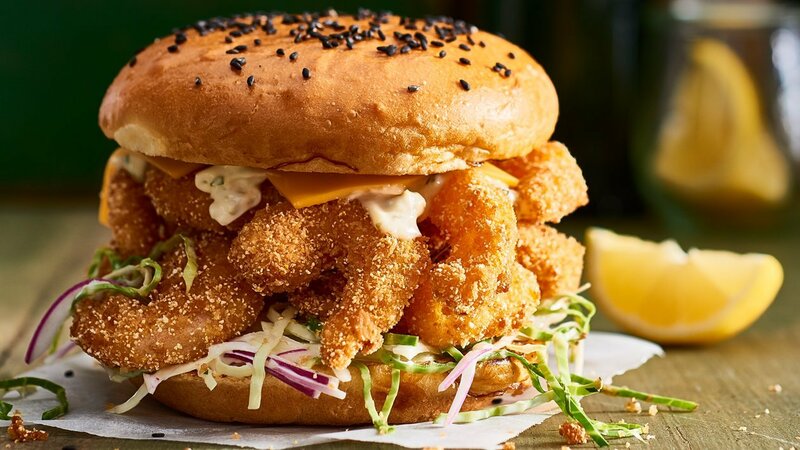 Assemble prawn rolls in the following order – bun base, slaw, popcorn prawns, jalapeno mayo, cheese and top bun.